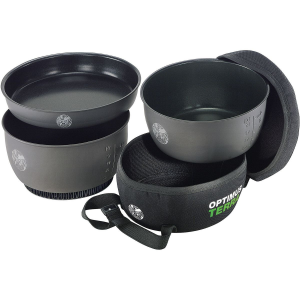 Great solo-sized two pot set for lightweight, compact backpacking. 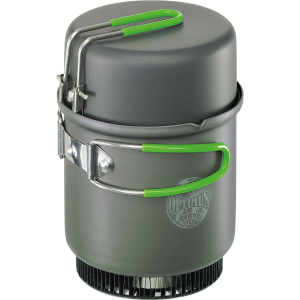 Easily fits a small fuel canister, mini stove, and lighter inside. Nice mesh stuff sack included. Very affordable! 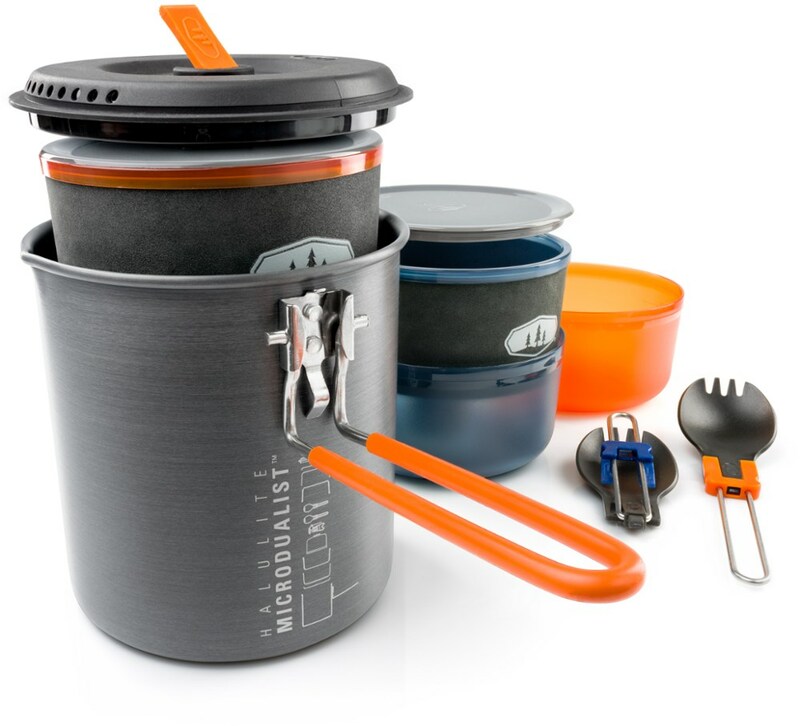 I've been shopping around for a lightweight, yet affordable, cook set for weekend backpacking. This one seemed to fit the bill, and certainly was the most reasonably priced set out there. And costing less than 50 freakin' bucks! The titanium pots out there look very nice, and come in at a nice weight, but they're just too cost prohibitive for me right now. They also tend to be a part of a much larger cookset than I was shopping for, or are no more than an oversized coffee mug that may (or may not!) include a lid. The other compact, 2-piece sets (GSI, REI) get closer, but come in costing at least $10 more. For that ten bucks, they toss-in something like a telescoping spork — which I would quickly give to my girlfriend's 6-year old son. He might actually like it. Which brings us to the Optimus Terra Solo. It meets my criteria above, and at a price point of $22-25, depending on catching a sale. While not as light as titanium, you're only gaining around 1.6 ounces over something like the Snow Peak 900, which cost $30 plus dollars more. What you get is a pot that boils enough water for a 2-serving freeze dried meal, with room to spare. In other words, you don't have fill your pot brimming full to boil enough water! The top works nicely as a pot lid, and does double duty as a mug or bowl. The fold out handles have a nice feeling, and actually effective, rubberized or silicone coating on them. The coating may rub-off or fail over time, but have been holding up surprisingly well so far. The handle for the top locks securely in place in the open position. Other nice touches here is that even though only one rivet attaches the handle bracket to the lid, the bracket's square top edge butts right up against the well rolled rim; even if this rivet loosened-up due to damage, the handle is prevented from swiveling. Nice touch! That said, the rivet does look securely set, and I wouldn't expect any problems. The pot's handle, a bi-fold design, is held in place with three rivets. While I haven't done any real sticky cooking in this, the anodized interior, while not technically non-stick like teflon, cleans easily. The final detail is stamped graduations on the pot in both U.S. and metric, although the lowest marked level is 8 ounces. It would've been nicer if it included a 4 ounce point for instant oatmeal, but this is a minor quibble. If you wanted to carry 2 fuel canisters, they will fit, but there's not enough room for anything else. However, my pack stove, the unfortunately discontinued Primus Yellowstone TechnoTrail, does fit nicely in the stuff sack above the cookset, so your kitchen stays together. Speaking of stuff sacks, it may be a good idea to make or find a mini sack to hold the fuel canisters/stove inside of the pot... It may be possible for these things to damage the anodized interior. And you can't use the included sack, since you need it to hold the non-locking cookset together. (I made one from ripstop nylon.) This may not be an issue, but I didn't want find out. Your mileage may vary. The upside of using a second bag is that it silences the metal on metal sound from inside of your pack. So far I've been very happy with this set. Happy enough to already be eyeballing the larger Terra Weekend set from Optimus for larger outings. The downsides are very minor, and really only included here in the spirit of full disclosure. For the price it can't be beat... Unless you really gotta have that spork. UPDATE: My set now has many outings on it, and is still hanging tough. The once bright green handle insulation has discolored to a more tan/green, but is still all there. And this includes many uses on canister stoves, as well as wood fires. Still very happy! Great little cookset! Good heat dispersion, non-stick coating and lightweight too. 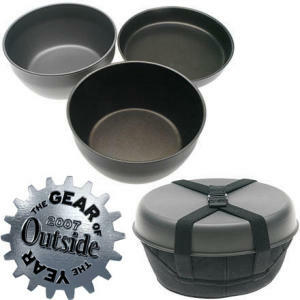 I like this cookset very much, it is currently my cookset of choice when doing solo trips in spring/summer/autumn. 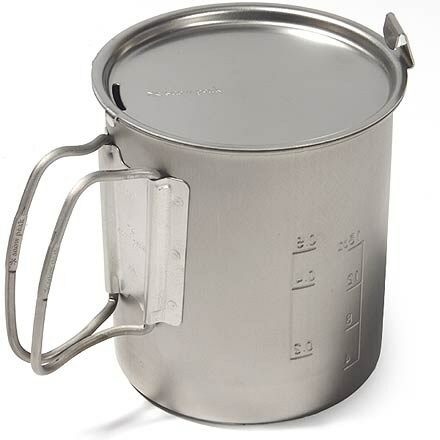 The pot, which holds 600ml, has marking on the inside and outside per 200ml and per 8 ounces. 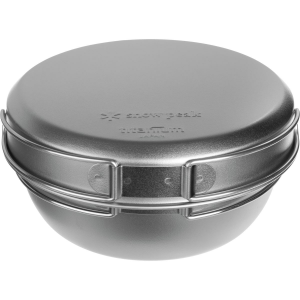 It is large enough to do single persoon cooking, spreads heats very well (no sticky, cooked-on food) and has a pouring lid for pouring fluids (or draining when using with the pan, for pasta/rice). The build quality is excellent, have used it a couple of times but no signs of use are noticable. Construction is solid, handles are securely attached. Will update this in a couple of months. Have used this since about two months ago, about 8 times. Not yet on holidays, only locally (Southern Netherlands). 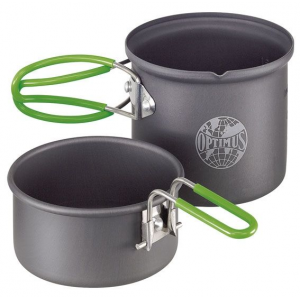 This is a nice cookset for lightweight campers who prefer cheaper (aluminium) above titanium. The material also ensures a better heat distribution. Although the set is small enough, you can pack a complete cooking kit inside of it. My set currently holds a 100gram gas canister, MSR Microrocket, microrocket piezo igniter, foldable spork which is all wrapped inside a cleaning rag. Everything you need, except the water and food is in there. At the price of €25-30 this should be a no-brainer for people looking for a simple, lightweight cookset.